Are you think 5v5 is still not enough for you ? Want to Play DotA more Fun with 1 more player each side ? Yes, maybe you should try this DotA 6.72c 6v6 Map. 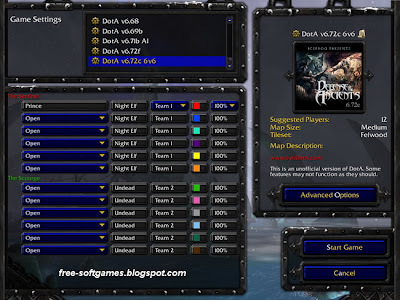 Can you imagine how nice DotA game which Played with 12 Players ? I thinks it'll be nice game :) Special thx for FuBash for this 6v6 Map, If there's a new 6v6 release has come, I'll post it as soon as posible and don't forget to Subscribe our feed for the latest news about DotA 6v6 maps. 0 Respones to "Free Download DotA 6.72c 6v6 Map (8MB) - DotA 6v6 Maps"